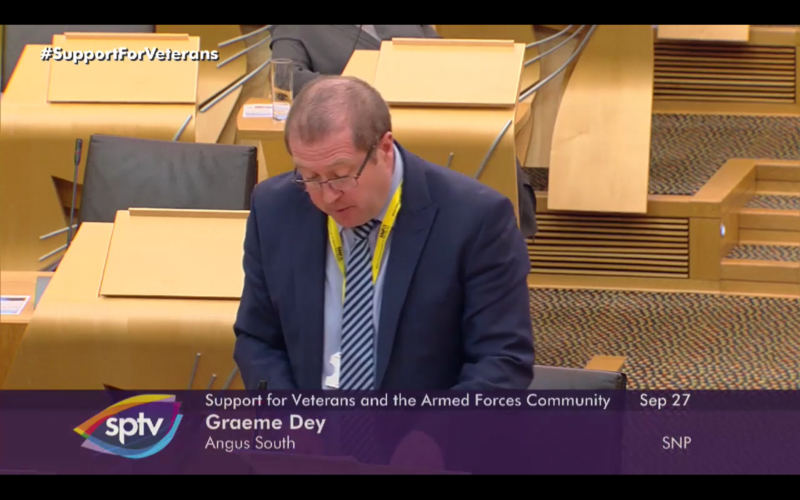 Graeme was yesterday afforded his first opportunity to close a debate as a government minister, as the Parliament debated Veterans and the Armed Forces Community (Support). Let me begin by thanking members for their contributions to the debate, which is one that has served to remind us that many MSPs from across the political spectrum have a close personal interest in our armed forces community. The role of veterans minister is one that I am delighted and honoured to take on. In the three months between my being appointed and this, my first debate in the role, I visited a range of organisations and employers that support veterans, met veterans ranging in age and situation, and had many conversations with them, which gave me helpful insights and ideas about where the Government needs to focus. It has all been extremely helpful, because my job is to build on the work that Keith Brown did to improve the lives of and support for members of our armed forces and veterans community in Scotland. It was excellent work, including the creation of the veterans commissioner post and the redevelopment of the Scottish veterans fund. I join Jackie Baillie, Maurice Corry and Mark Griffin in recognising that. I welcome the helpful pointers in the contributions of a number of colleagues today. Maurice Corry noted the role of local health and social care partnerships in delivering services. I agree with him. They are pivotal to the delivery of long-term sustainable services and I expect them to deliver in a way that reflects veterans’ priorities and the military covenant commitments. Angela Constance noted the work of Scottish War Blinded. When I attended its annual conference, I was struck by the incredibly positive view that users had of the support that is afforded them by that organisation. Brian Whittle highlighted the work of Hollybush house, which I visited recently. He is correct about the great work that is done there by Combat Stress. In acknowledging that, I note the partnership working that has gone on between Combat Stress and NHS Ayrshire and Arran. The analogy that he drew between athletics and the armed forces was thought provoking and I think that it will have resonated with the veterans present. Alex Rowley, in another thoughtful and considered contribution, touched on the data gathering issue. I am not in a position to greatly expand on what I said to him in our exchange of letters but, for the benefit of other members, I say that the Government is looking at how information that is held on the NHS central register might be transferable to the Information Services Division, in order that we can improve the collection of data on veterans who have contact with NHS mental health services. Once established, that information can be used not only to track the tragedies that at times occur but to highlight those who are at risk and identify what support they might need. There is a lot of potential there, and I welcome Alex Rowley’s interest in that subject. Gordon MacDonald and James Dornan offered some interesting ideas on housing. I acknowledge James Dornan’s efforts to secure the commitment of GHA to provide 10 houses annually specifically for service personnel. There were a number of other welcome contributions. Jackie Baillie set me a series of challenges. I will not have the time to respond to her in detail, but I, too, look forward to engaging in them—I think. One of the first tasks that I embarked on in government was to undertake a range of discussions with my ministerial colleagues to ensure that we have a whole-of-Government approach to supporting our armed forces community. I am pleased to say that, across areas such as health, housing and employability, the response has been entirely positive. We will be working closely together, and potentially with other colleagues in the years ahead, to improve and refine the support that is on offer to our veterans. Partnership working across the public, private and charitable sectors is also key here, and the role that is played by armed forces champions in local authorities remains crucial. I am committed to strengthening our network of champions in local authorities as well as other public bodies, and working in genuine partnership with them. As well as updating Parliament, the debate has provided an opportunity to welcome our new veterans commissioner, Charlie Wallace, to his post and to thank Eric Fraser for his work over the past four years. I echo the earlier words of thanks to him from around the chamber, and I note in particular Eric Fraser’s work to change perceptions and ensure we see veterans as assets. That has been incredibly important. This week, the Scottish Government published “Scottish Government Support for Veterans and the Armed Forces Community in Scotland”, which sets out some of what we have delivered but also highlights the actions that we are taking to look across ministerial portfolios at service delivery in order to identify and understand areas for improvement. The needs of veterans are likely to change in the years ahead as we see a shift in the demographics of the veterans population, so it is right that we consider how we need to adapt to that. As part of reviewing our service provision and in keeping with the partnership approach that I touched on earlier, we are working with the Ministry of Defence and other devolved Administrations on a new veterans strategy. We are extremely aware that accurate data and better identification at the point of referral are essential if we are to develop a clearer picture of needs, so I am delighted to confirm a positive outcome to the Royal British Legion and Poppyscotland’s count them in campaign, which Angela Constance spoke about. Earlier today, the National Records of Scotland set out the current plans for the 2021 census, which include a new question to provide robust statistics on the size, location and profile of our veterans population in Scotland. I know that that plan will be welcomed widely and that it will help us, along with our partner organisations, to develop and improve services. The final decision will lie with the Scottish Parliament, but I can advise members that, subject to the legislative agenda, a draft order will be laid in late 2019. However, we are also aware that easy access to the right information is vital for the armed forces community, particularly for those who are transitioning out of the services or moving to Scotland for the first time. Over the past year, the Government has continued to improve how we provide information about services that are available. For example, in June we published the “Welcome to Scotland” guide. Information was a key recommendation in the commissioner’s housing report, and this year we published an updated version of the housing guide, redesigned to improve its content, visual impact and accessibility. I continue to work with the Minister for Local Government, Housing and Planning on how we can better address and prevent homelessness among our veterans population. I welcome the minister’s comments. In relation to MOD housing, I have had some success with the Royal Navy at Faslane, where we have moved families around. There is an open door and an opportunity. If the minister would like to discuss how I did it, I am more than happy to do so. There is an invitation for the minister—you can answer, please. That is another invitation to engage, and I will take that offer up. The veterans employability strategic group is progressing our engagement on employability and it continues to take forward the veterans commissioner’s previous recommendations, including work placements and the accreditation and mapping of military skills into the civilian workplace. Earlier today, I was pleased to launch a veterans employability concordat with key partners on the veterans employability strategic group, which sets out our enduring partnership arrangement to support those who are transitioning from the armed forces into fulfilling civilian careers. We are also accelerating opportunities to create business workspaces near military bases to help those who want to develop their own businesses. We are lucky to have a strong veterans charitable sector here in Scotland, and I have already had the opportunity to meet Veterans Scotland, Poppyscotland, Legion Scotland and many others that are delivering great support. The Scottish Government continues to support veterans organisation and charities directly through the Scottish veterans fund. Those projects and initiatives provide essential support to our veterans community. This year marks the 10-year anniversary of the veterans fund, with more than £1.3 million given to more than 150 projects throughout Scotland. Looking to the future, I can say that our focus will continue to be on working positively and collaboratively across Government and more widely with the charitable and private sectors to champion our armed forces community. There are great examples of support for veterans throughout local authorities in Scotland and I am keen to see that best practice shared widely. I am also keen that we continue to see cross-party support, both here and more locally, on delivering for veterans. Today’s debate shows that MSPs, in the main, are capable of taking that approach, and I acknowledge and welcome that. We know that we lead the way in many areas here in Scotland, but it is right that we take stock in order to maximise efficiency and adapt to changing needs. My ministerial colleagues and I, along with other members, remain committed to providing the best possible levels of support for veterans, both now and in the future.